Kids and adults alike love the Finding Nemo and Finding Dory movies and characters. 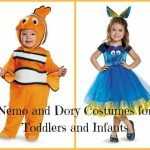 Any small child would love dressing up as one of their favorite characters from the movies for Halloween or other dress up fun. 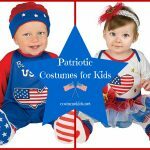 There are several terrific costumes available for infants and toddlers to make this Halloween a memorable one. 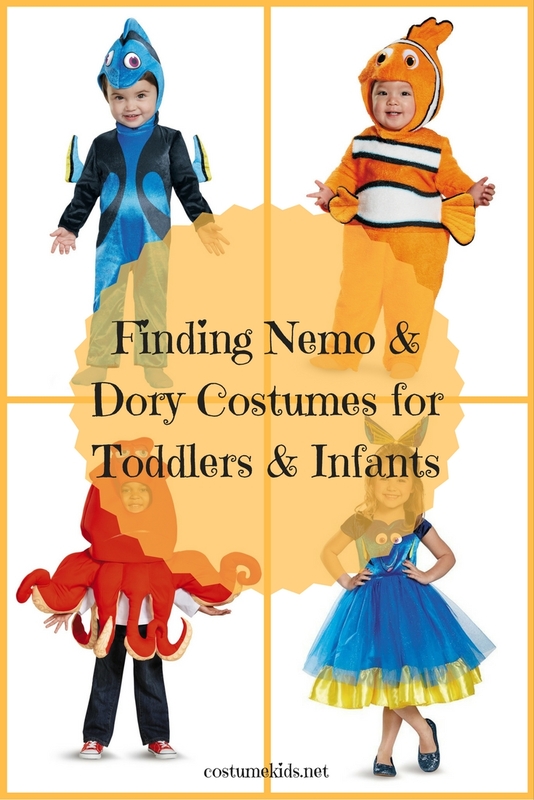 Here we take a look at Finding Nemo and Dory costumes available this year. Available in sizes 6 to 12 months, and 12 to 18 months. This costume includes the jumpsuit and hood made from soft 100% polyester micro fleece fabric. Costume has a back zipper with the fins sewn to the sides and back. The hood fastens with Velcro under the chin, with fin and embroidered eyes on top. 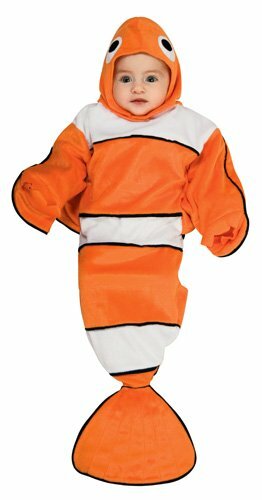 Costume is orange with black and white accents, just like a clown fish. Super cute and warm choice for Halloween dress up fun. This costume is available in sizes 3T and 4/6. Costume includes the tunic and headpiece made from 100% polyester foam fabric. The separate 3D headpiece has an attached internal hood and closes with Velcro at the neck. Tunic fastens with Velcro in the back and has stuffed tentacles and stuffed tentacle sleeves. Reddish-orange color with eyes on the top of the headpiece. Super cute costume the kids will love. 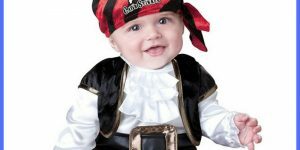 This costume comes in sizes 6 to 12 months and 12 to 18 months. Costume includes the jumpsuit, tail, and hood. 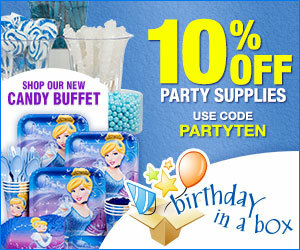 Made from 100% polyester fabric, fiberfill, and mesh and 100% polyurethane foam. Jumpsuit is made from Velour and fastens at the back with Velcro. Fins are made from foam and sewn to sleeves. Tail is made from foam and fastens to the jumpsuit back with Velcro and foam hood fastens under the chin with Velcro. Hood has a crest on top and soft, sculpted eyes. 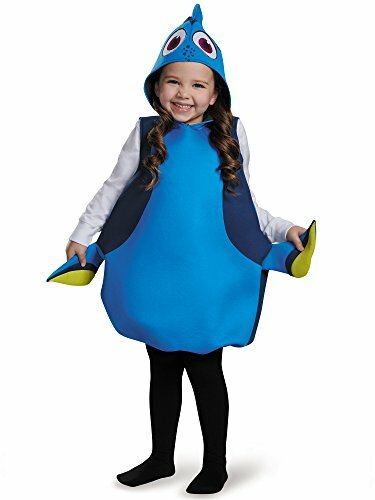 This adorable Finding Dory costume comes in one size. Costume is made from polyester and includes a 3D plush pullover with a detachable tail and headpiece. Hood has a fin on top and the main costume has a tail in the back and fins on each side. 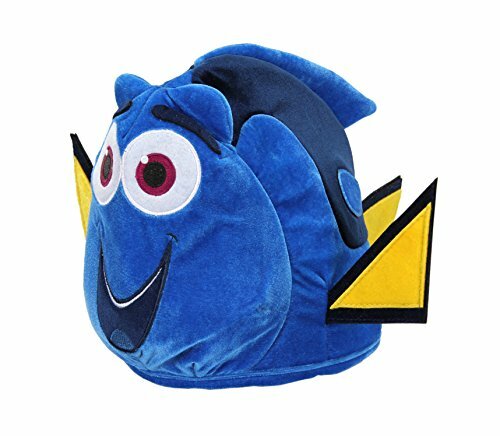 The face of Dory is on the front of the pullover costume. This costume includes a dress and headpiece made from polyester fabric. The headpiece is blue and greenish-yellow and looks like fins. The bodice of the dress features the face of Dory on the front. Short sleeves are dark blue. 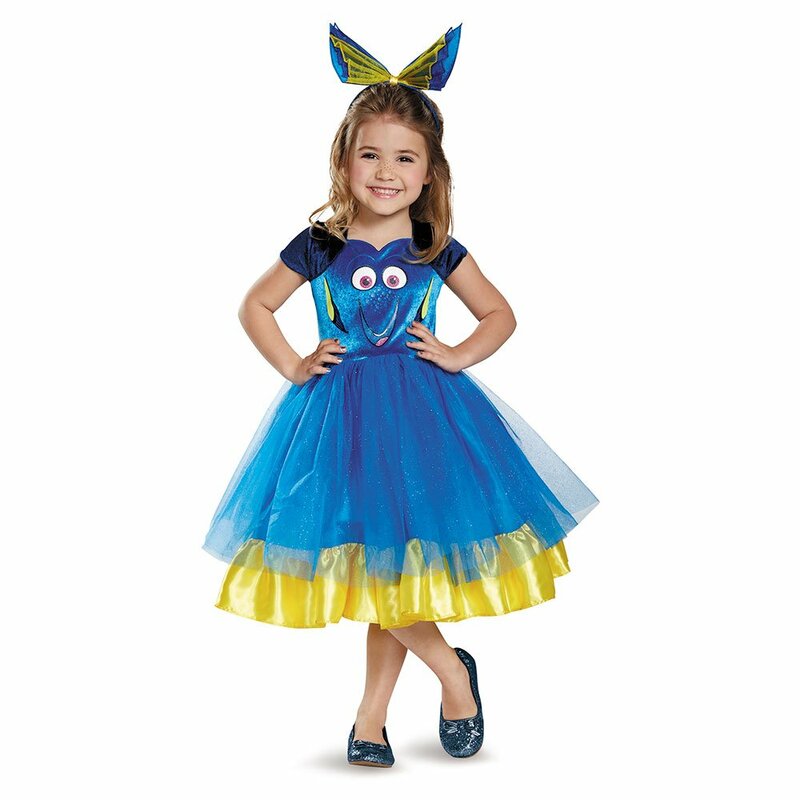 The skirt of the dress is a bright blue tutu and the bottom part of the skirt is trimmed in a yellow satin fabric. 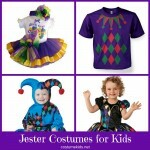 Makes a super cute Halloween costume or dress up costume for everyday fun. This costume consists of an extra soft plush jacket that has a full front zipper and an attached hood. Keeps baby cozy and warm on a chilly Halloween night. 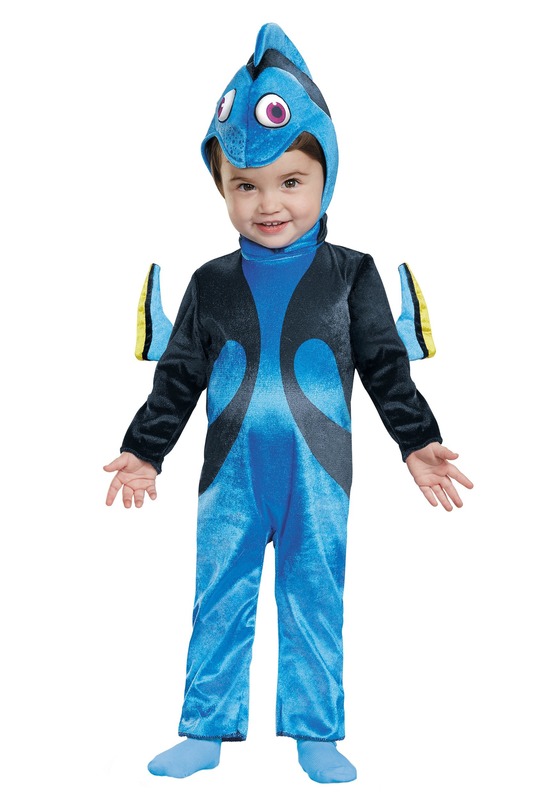 Costume is an olive green color with attached fins. 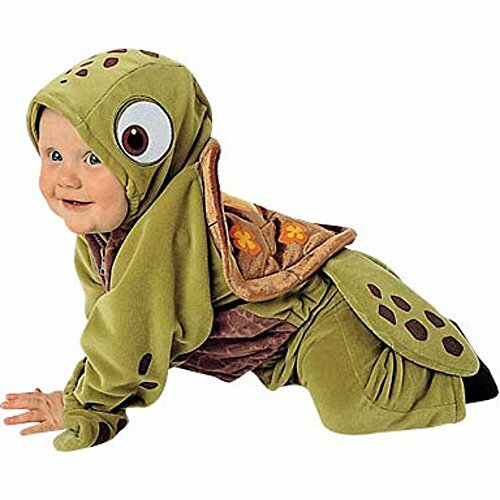 Front of the costume is brown and the back has an attached “shell”. Hood has brown spots and large eyes on each side. This is a great one size hat that would be good for little ones because it doesn’t obstruct their vision. Made from polyester , hat is made from orange velvet with white and black trim. Size of hat can be adjusted using the Velcro elastic size adjuster. Hat allows kids to bundle up on a cold Halloween night and still be in costume. This is a cute character hat that fits almost all head sizes for ages 3 and up. Hat is ultra plush and bright blue and has a highly detailed face. Made from polyester. Super cute idea to wear for Halloween or other dress up fun. Blue body with yellow fins trimmed in black one each side and in the back. 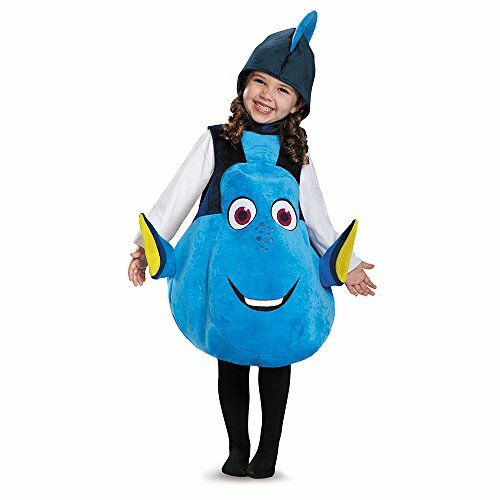 Kids will love dressing up as the forgetful Dory and can still wear their warm clothes if the night is chilly. This is a one size costume that includes the tunic and headpiece. Features a light blue body and dark blue accents, with black and yellow accents on the fins. Headpiece features the eyes, leaving the child’s actual eyes exposed for clear vision on a dark Halloween night. 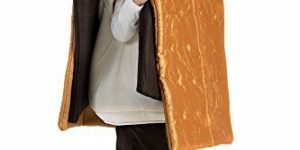 Costume allows for children to wear warm clothes underneath without obstructing the view of the costume while trick or treating. This costume comes in a “one size” and includes the tunic and headpiece. Bodice is orange with black and white striped accents. 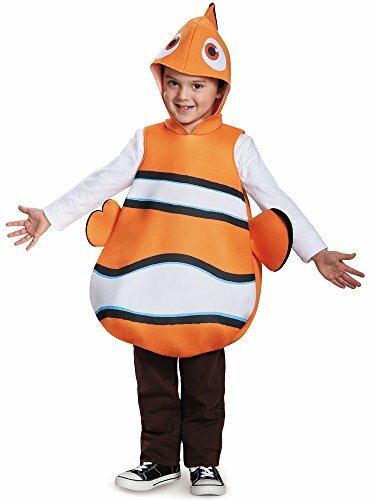 Costume has fins on either side, one being Nemo’s smaller, weaker fin. 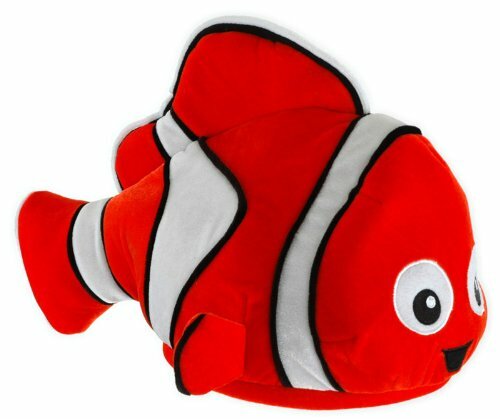 The headpiece features the eyes and top fin of Nemo. Makes a good choice of costume because it leaves the child’s field of vision clear. 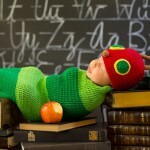 Costume lets the child wear their warm layers under it to keep them warm on those chilly Halloween nights. 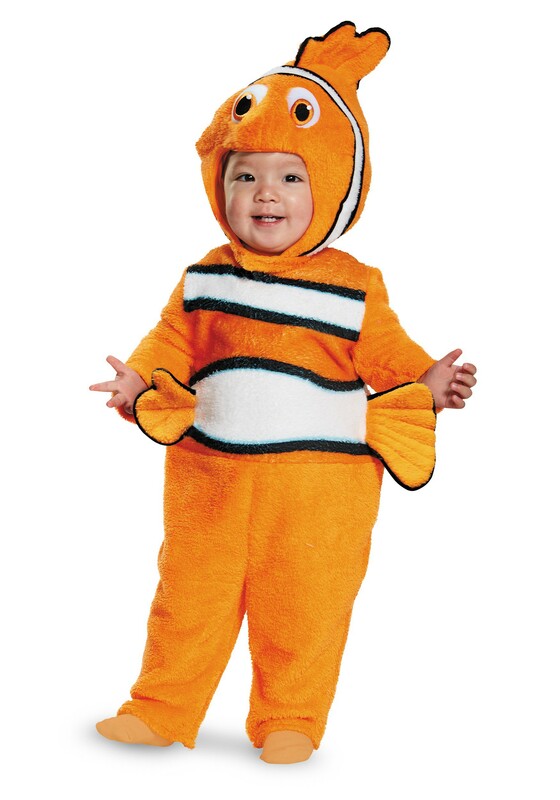 While this is not an officially licensed Nemo costume , it is definitely a cute one that will work. 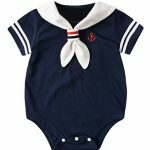 Comes in size 6 to 9 months and is made from 100% polyester. Garment can be hand washed. Comfortable fleece fabric has a fastener in the back for putting on and taking off. 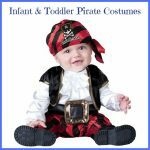 There are several terrific costumes available for infants and toddlers to make this Halloween a memorable one. 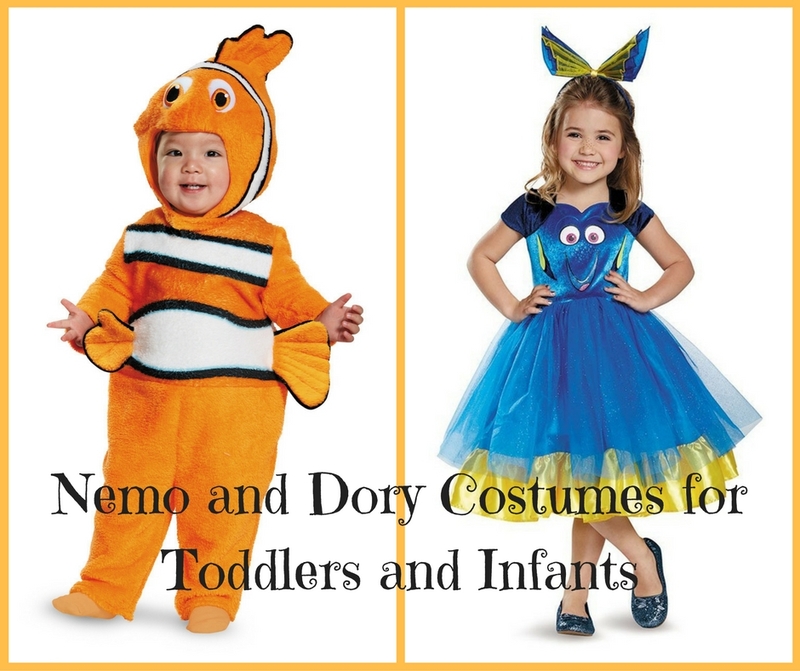 Here we take a look at Finding Nemo and Dory costumes available this year.